One of the most popular internet motorcycle blogs "The Kneeslider" recently attempted to answer the eternal question "Horsepower or torque?" "Both terms are important but they represent different things. Torque measures a force being applied while horsepower is a measure of how much work the force can do." Now just a cotton pickin minute. 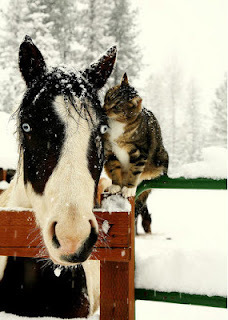 Didn't I write a blog explaining horsepower and torque in December 2008? Now, apparently I will have to explain it again and I obviously must do a better job this time. I need to prove the point in a nice simple way, once and for all, that torque is not a good indicator of engine performance, but horsepower is. The fallacy in the torque argument has to do with where the torque is measured. Torque numbers are always taken at the engine, but it actually needs to be measured at the rear wheel, because (1) it is only at the rear wheel that the torque produces thrust that drives the vehicle. And (2) torque is multiplied arbitrarily in the gearbox, that lies between the engine and the rear wheels. The problem, restated, is that torque measured at the crank in the engine is not meaningful, because it can easily be multiplied, or divided by the gear box, or a chain or belt drive with sprockets, or any place the shaft speed changes before it arrives at the rear wheels. You can increase or decrease torque infinitely, simply by changing the gear ratios or sprocket sizes. Only comparisons at the rear wheel are meaningful in real world performance. Measurements inside the engine are of academic interest only. In spite of the gear ratios, crank horsepower is a fairly good indicator of rear wheel horsepower, while crank torque all by itself is not a good indicator of rear wheel torque, unless both vehicles are forced to run at the same number of revolutions per minute, and have the same gearing. So looking at the numbers, you might call foul. Why does the high horsepower vehicle get to have a 4:1 drive ratio, while the high torque vehicle has a final drive of only 2:1? That's because the high horsepower vehicle generally has a high speed engine, and it can (in this case) run at twice the speed of the high torque/low horsepower engine. That allows you to run a higher overall gear ratio. And that is how gear ratios are decided on in the first place. So the secret of high torque, but low horsepower engines, is that if you do not measure speed, then high torque sounds good. But when you do measure speed of these types of engines, you invariably find that they have a low rev-limit. i.e. they are slow, and cannot be driven with higher gear ratios. The kneeslider article had a lot of comments, and one of them was in the form of a video. The video showed a drag race between a 70 hp Harley chopper, and a 170 hp sport bike. The chopper won easily, supposedly proving that torque was more important than horsepower in a race. As I watched the drag race between the chopper and the sport bike, I was struck by how the cards seemed to be stacked against the sport bike. -The race was extremely short, just down a back alley. In a short race, reaction time is almost as important as horsepower. And it's quite obvious in the video that the chopper gets the initial start a few lengths ahead of the sport bike. -A sport bike rider has to be fairly delicate about launching quickly off the line. Sports bikes are high and short, and with enough power to lift the front tire, or even flip completely over backwards. Sports bikes are not made for standing start drag races. The chopper actually looks more like a drag bike, with a long wheelbase and low seat. You would not have to worry as much about wheelies off the line. -There are important unknowns, for example the type of tires being used, and the experience/skill of the riders. -An engine like the Harley V-Twin has a large flywheel. You can store extra energy in the motor by revving the engine up before the start, then dumping the clutch. With a sticky rear tire, heavy flywheel, and a long, low bike, it is almost like getting a running start at the line. In other words, the video has too many random variables other than the horsepower/torque numbers of the engines. In any kind of actual race, you want horsepower, and you don't need to be concerned if your torque numbers are not the highest. If you are just driving slowly, and you will rarely run your engine at high rpm, then buy a slow engine and don't worry about power. You can probably also not worry about the torque either, unless you literally cannot get up the hills or keep up to the speed limit. Here is an explanation that is about as close to reality as any I have seen. 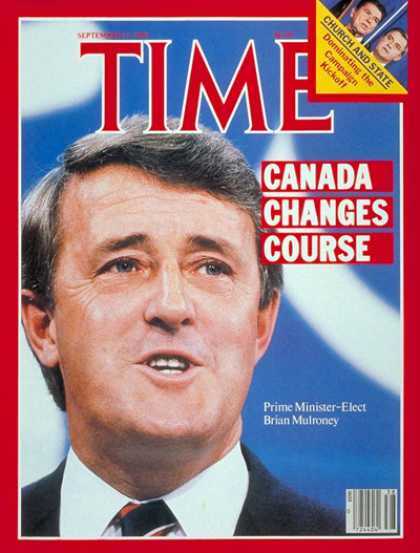 Brian Mulroney, Prime Minister of Canada from 1983 to 1993, was born in Baie Comeau, Quebec. Coincidentally so was I, but I was never Prime Minister of Canada. I have said in my blog that I voted Conservative twice, both of those were for Brian Mulroney. (not in the same election, of course) I used to be a lot more conservative back then, than I appear to be today. Partly because I have changed a little, but more because of the extremism on the right in the USA, which spills over into Canada. Although Brian Mulroney was elected democratically twice, by the time his last term was finished, Canadians hated the Progressive Conservative Party of Canada so much that the party no longer exists today. When I took a vacation in Saint Lucia in 1992, Mulroney's reputation had sunk very low. A local street vendor approached me to buy some coconuts, and somehow it slipped out that I was Canadian. He offered me his condolences, because we had such a horrible Prime Minister. St Lucia was not the first time I had problems with Brian Mulroney's reputation. When I was teaching in Sept-Iles QC, in 1973-75, Brian Mulroney was the CEO of the Iron Ore Company of Canada, and Sept Iles was a one-company town built by IOC. The teachers on staff knew that both of us were from Baie Comeau, which was located not very far away. Brian was in the process of shutting down the IOC's biggest iron mine, which did not sit well with the townspeople. So I got several comments associating me with Brian, which was not true, as I never knew him or even attended the same school with him. And anyway, he was ten years older than me. When Brian became Prime Minister, all of a sudden Baie Comeau went from being a quiet unknown backwater town to being a well known town nationally. Before this, if someone asked where I was from, I could say Baie Comeau, and generally receive blank stares in response. When Brian campaigned for prime minister, he made a very big deal being a "boy from Baie Comeau". So after that successful campaign, whenever it came out where I was from, I was always asked if I knew Brian Mulroney. And as time went on, and Brian became more and more hated, I felt a greater need to distance myself from him, pointing out that I always lived on Laval St. while Brian lived on Champlain St. The notoriety has died down a lot, but today I occasionally have this same reaction from people who find out where I live. Canadians apparently have long memories. Compared to today's conservatives, I think he was a good prime minister. But there was the GST tax, that I suppose most people still blame him for. I don't feel the GST was a bad tax, as it replaced a hidden tax. But many Canadians think differently. On the other hand, he initiated the Acid Rain pact with the USA, that effectively put a stop to the acid rain pollution in the eighties. Brian also spoke out against South Africa in the international campaign to stop apartheid. Brian also brought in the Free Trade pact between Canada and the USA, which has given us prosperity even up to today. Yes, I know Canadians love to complain about how poor we are, but that's because Canadians don't get out much, and half our brains, and all our asses are frozen in winter. That's the simple excuse for our stupidity. Long after Brian Mulroney left office, we found out that he had accepted bribes from an aircraft manufacturer to buy their merchandise. Back when Brian was debating Liberal John Turner in the first election, it was all about appointing political friends to the senate (as it is again today). During the debate, Brian pointed out all the recent dubious Liberal appointees to the senate (made by the previous leader Trudeau) and asked why John Turner did not cancel them. Turner Replied that he had no option. "You had an option, sir. You could have said, 'I am not going to do it. This is wrong for Canada, and I am not going to ask Canadians to pay the price.' You had an option, sir--to say 'no' — and you chose to say 'yes' to the old attitudes and the old stories of the Liberal Party." Once again I got talked into buying a helmet. I was looking for something between my half helmet, and my full face helmet. I should just wear my full face all the time. But there are some downsides to it. It is heavy, and too big to fit under the Burgman seat. It is too expensive to leave strapped to the bike and bulky to carry around. And now I find that sometimes it makes my nose itch. When my nose itches, I have to keep lifting the face shield every few minutes to scratch it, and it is a distraction when driving. I bought a new style of helmet that has become popular in Europe, sometimes called a Scooter helmet, sometimes a flight helmet. Basically it is a traditional 3/4 helmet, that covers the ears but not the chin. However, the hard shell covering the ears is shorter than usual, and has a flexible extension. This way, the helmet can be pushed down to fit under the seat of a scooter, but still has some protection for the ears. Another characteristic of the scooter helmet is a pivoting face shield, a bit shorter than the normal visor. It reaches to about nose level, and has a cutout for the nose. This again helps it store more easily, but allows bugs to hit you in the mouth, unless you have a windshield on the bike. In Europe these helmets are sometimes called Momo helmets, after the design company that made them popular. Momo design helmets cost over $300, but there are cheaper versions available from Zeus, CKX, Vega, and a few other manufacturers. They take some of their styling cues from the Momo helmets, sometimes almost appearing to be a knock-off. I found a scooter style helmet going for $40 at the Tri-City cycle discount outlet in Cambridge, so I bought it. It was a CKX and also had a European style ratcheting quick-connect, instead of the traditional D-Rings. 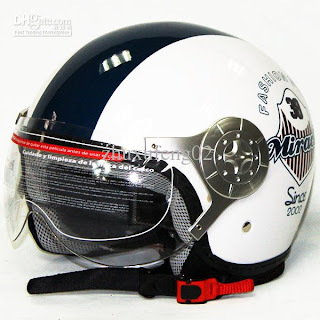 It had an inner drop-down tinted visor as well as the clear external visor, and had the letters DOT on the back. One thing I am starting to notice is that helmets have gotten bigger since the 1970's. Back in the old days, helmets were about an inch thick all around. Now they are more than 2 inches thick. I guess that gives us greater protection, and today people are accustomed to the look of these huge astronaut-like helmets. They would look very funny to anyone who was frozen in 1969 and thawed out in the twenty first century. I found it a bit strange that a medium fit me. Usually I take large. But my friend Bob, also trying on the helmets, found that even the large was not big enough for him, and they didn't have the XXL sizes available. I guess it must have something to do with head shape, something else we never considered important in the seventies. Apparently there are big differences between round and oval headed people. I took the helmet for a long test ride, and found that it was comfortable, but was too loud at high speed with the clear visor up. That problem was easily solved by lowering the clear visor. In direct sunlight, the clear visor was a bit milky if the sun was on it. I find that direct sunshine will light up any imperfections, and make it harder to see through. I cleaned off the visor and put some car wax on it, and that took care of the problem. I did the same to the tinted visor, but the wax seemed to make it worse. Anyway, it's not a huge problem, and so I'll let it go. So far I have found no mention of problems like this on the internet, and I don't really understand how this could happen. Today I went down to Port Dover on my 1969 Honda CD175. I wore the scooter helmet with my black leather jacket. I don't know if the two styles go together, but I'm guessing they do not. I probably should wear the scooter helmet while riding the Suzuki Burgman, and I should have a hooded brown canvas jacket also. I'm trying to remember what kind of jackets we wore riding Hondas in the seventies, but all I can remember is riding in short sleeve T-shirts, bell bottom jeans, and helmets with bubble shields. Picture: Not my own helmet, but a similar style. Finally after six years of back-to-back Obama scandals, I realize the right wing people are not nut jobs. It looks like they were right all along. A few days ago, there was a joint press conference with the Prime Minister of Turkey and President Obama of the United States. During the conference, there was a light drizzle of rain. 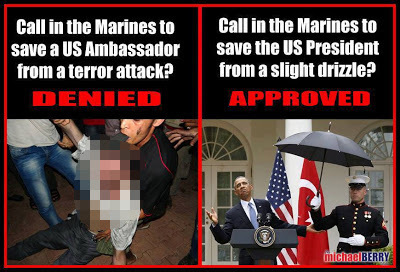 Obama forced two US Marines to hold umbrellas: one over his own head, and the other over the head of the Turkish state. To me, this was an insignificant act. The marines were standing around doing nothing anyway. It's not like they were busy at the time rescuing the U.S. Ambassador in Benghazi. No no, they were just standing around listening to a bunch of stupid questions being fielded by Obama and the Turkish guy. They were probably hoping the rain would intensify enough to call off the whole thing. But I was wrong. This was not insignificant. What I did not know, was that no US president had ever asked a Marine to hold an umbrella over his head during a press conference - other than Obama. And it was not the first time for Obama either. The linked video clearly shows pictures of various Presidents holding their own umbrellas, and other pictures of Obama getting marines to hold his umbrella. Now for the true insult of this seemingly small act. If you didn't notice yourself, don't be embarrassed. It means you are probably not from the Southern U.S. Many Canadians, like me, will miss this too. Here is the clue: Look at the skin colour of the two men. The one holding the umbrella is white, the one having the umbrella held over him is black. Therein lies the insult to real Americans (i.e. Southerners). The true American way to do this, and one that would not have raised a single eyebrow south of Cincinnati and East of Waco Texas, would have been for the white guy to be the President of the USA, and the black guy to be the Marine holding the umbrella. This umbrella thing was Obama's plan all along. Health Care was a mere diversion. Killing Osama Bin Laden, a smoke screen. Boosting the Dow Jones from 7,000 to 15,000 in six years was a red herring. The hidden plan was to humiliate the white race by making them hold umbrellas for black people, thus destroying the real America. There is no going back. Real Americans will have to reluctantly, and with heavy hearts, begin gearing up for the second Civil War (or as real Americans prefer to call it: "the Second War Between the States" or "Second War for Southern Independence" or "Second War of Northern Aggression".) And finally, Al Quaida's plan will be complete: America torn apart just like they destroyed the Soviet Union back in 1990. All their thanks go to Obama. On the CBC last night I watched Power & Politics with Evan Solomon. They had a panel discussing the Mike Duffy affair. In this case, Senator Mike Duffy accepted a gift of $90,000 from the Conservative Prime Minister's Chief of Staff. In the panel discussion, I thought there was a lot of unwarranted support for Mike Duffy. Maybe they were even handed because the CBC is afraid of losing its government funding. But in my mind, and the mind of 97% of Canadians, this gift was against the law, which clearly says senators cannot accept gifts. I do not accept the excuses given. 1. That the gift came out of the personal pocket of the Chief of Staff makes no difference to the law. 2. A second argument was that the gift was simply to cover the money that Mike Duffy was forced to repay the government from a previous scandal involving expenses. This is a red herring. 3. That Mike Duffy is sick, (possibly dying??) and is trying to protect his estate from a huge debt load. While of course I have some human sympathy on this, it really should not enter the debate, as Evan Solomon mentioned last night. 4. The rules are confusing. There is a reason why Senators are not allowed to accept gifts, and that is to protect our government from corruption in office. I know people try to get around this law all the time, but that makes it even more important to protect this principal of our political system. Why are we even debating it? Might as well just end this farce of democracy right now, if that's what we really think. Luckily, most Canadians are not yet stupid enough to let it go. Mike Duffy has a questionable history, too. He was once a journalist, who helped the conservatives get elected a few years ago. He aired a show that made Liberal leader Stephan Dion look foolish, days before the election. After Dion lost the election, Duffy was awarded the position of Senator by the Conservative leader Stephen Harper (who won the election). 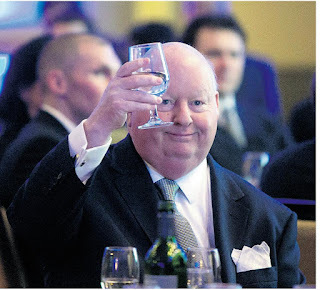 It seems that Mike Duffy's ethics and principles are just as weak as a senator as they were as a journalist. He never really seemed to understand that this political position was not just a reward for underhanded political hacksterism. A senator in the federal government has certain responsibilities, and is actually governed by a code of ethics, even though I suppose many people treat it as a joke in Canada, where senators are not elected. But Mike Duffy seems to understand very little of the requirements of his post. And I believe some of the blame goes back to Stephen Harper, who once promised to eliminate the Senate, but now pads it with ignorant sycophants. Last night I was watching the Daily Show with Jon Stewart. Jon Stewart is usually a pro-Obama supporter, although he claims to be neutral. Last night Jon sided with Fox News against Obama on one (or maybe two) issues. Mainly, it was the issue of the IRS investigating right wing organizations. Apparently the Internal Revenue Service in the US is targeting Republican political groups by investigating their tax-exempt status, while letting Democrat (or liberal) groups get through without much scrutiny. I disagree with Jon Stewart on this. By the way I also disagree with Fox News, but that almost goes without saying. And now, since Obama has apologized, and says changes will be made to the IRS, I also disagree with Obama. The IRS is supposed to investigate organizations seeking tax exempt status. That is how they discover fraudulent operations claiming tax exempt status. If you stop them from investigating organizations that have right wing sounding names, you are simply giving a pass to organizations with "Tea-Party" or "Patriot" in their names. Let's assume there are lots of fraudulent operations in the USA applying for tax exempt status, just for the sake of argument. Even before this scandal, it would be likely that many of these scams would be targeting gullible right wing fanatics. That is because gullible right wing fanatics have lots of money, and of course they are gullible. So the logical thing to do would be to put words like Tea Party, or Patriot in their name. Just because they are called "Patriot-Tea-Party-something or other", does not mean these scams are truly right wing politically. But now that the IRS cannot investigate any new organization that sounds right wing, I think all of these fraud artists will be soon be using right wing sounding names. 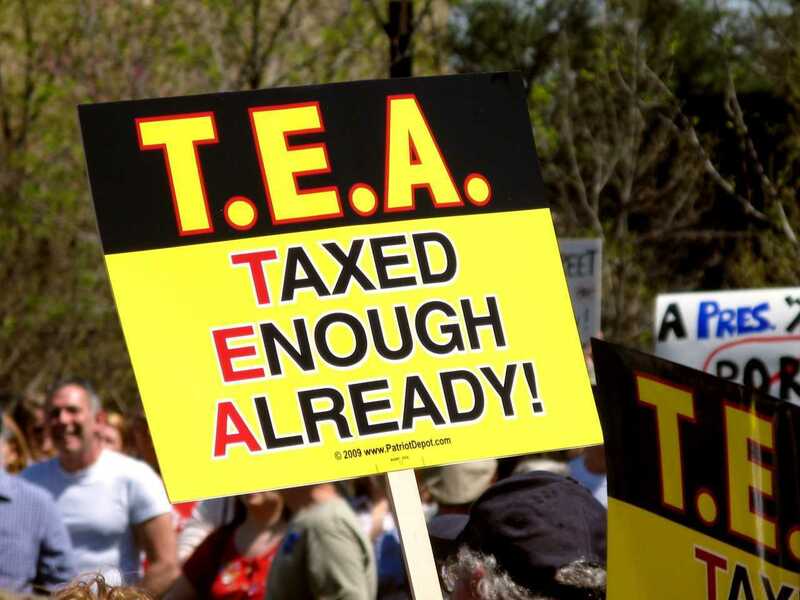 The IRS was actually helping the Tea Party by weeding out fraudulent operators preying on their right wing supporters. But, to be fair, as Newt Gingrich says, the IRS should at least spend equal time investigating organizations applying for tax-exempt status with "Terrorist" in their names. About 15 year ago, while at a party that involved some alcohol, I made a comment to a group of acquaintances, that it seemed like there was an increase in the level of stupidity in the U.S.A., and possibly Canada too. Someone responded that I had no proof of that, and that often people mistake stupidity for opposition to their own ideas. Which I would have to admit was true, at least as a general statement. But in the years since then, I have not been able to shake the idea that stupidity is on the rise. So it's time to come up with some identifiable characteristics of a stupid society. 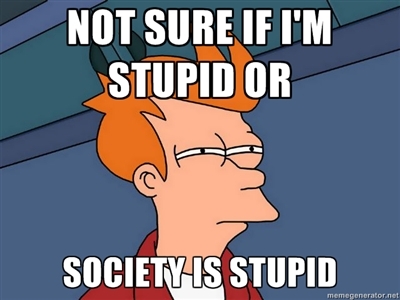 First let me distinguish between a stupid society and stupid people. 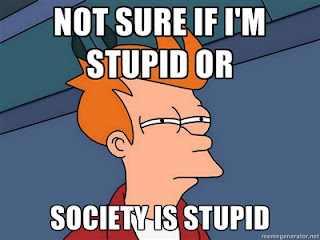 A stupid society means that the society as a whole does stupid things, not necessarily the people within the society being more stupid. Maybe I should substitute the word "ignorance" for "stupidity". I hope that does not change the basic argument, because I was not trying to get into an argument about the meaning of these words, What I meant was that society was becoming more stupid or ignorant, making wrong decisions when knowledge and logic could have helped make a correct decision to benefit almost all. Here are the top ten ways I think you can spot a society that is stupid. 1. Low literacy rates. I feel like the less that people can read, the more stupid a society becomes. Or, Increasing numbers of school dropouts. 2. Lack of respect for formal schools and education. Preference for fundamentalist religion and religious teachings including miracles, superstition, magic, witchcraft, etc. 3. 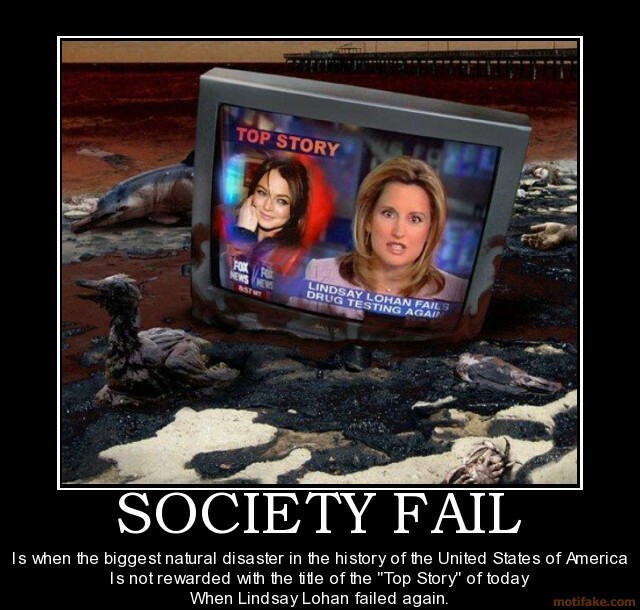 The media heaping scorn on scientists, theoretical researchers, intellectuals, free thinkers. Praising people with no formal education, who also have very little knowledge of history, science, math, economics, or world geography. 4. The rise of charlatans, who make fortunes in tricking gullible people into believing their false stories. 5. Intolerance, xenophobia, and racism. Religious freedom does not exist, or is threatened. 6. Political ideology becoming more like group-think than a real vision for the future. 7. Important national decisions based more on religion or political loyalty, than on evidence. e.g. starting wars vs. protecting the environment. 8. Erosion of democratic power. Apathy about voting. 9. Concentration of all wealth in the hands of a few. Everyone is out for themselves, including both the haves and have-nots. Greed is a higher motivating force than the common good. Also, quick profits being more alluring than a sustainable future. 10 Breakdown of the rule of law, where more and more exceptions are made to allow torture, invasion of privacy, racial profiling. Probably more people being jailed, more crimes committed also. Some people being exempt from the law. People taking the law into their own hands. State-sponsored assassinations. By most of these measures, you could rate a medieval kingdoms as ignorant and stupid. But to be fair, it takes a long time to acquire wisdom about how to govern a country fairly. But it is "society fail" to have a country with a tradition of democracy and universal education, and to let that slip away to superstition and brutality.